Plasma-transferred arc (PTA) welding is a weld process for applying wear-and corrosion-resistant overlays on surfaces of metallic materials. It is applied to various components in a variety of applications and industries. 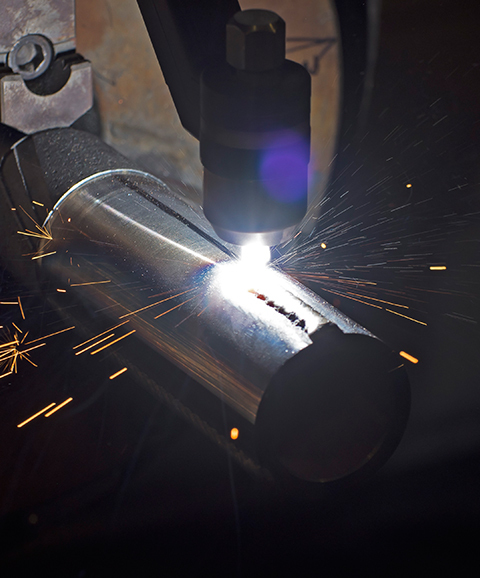 We deal with numerous industries providing industrial welding for part manufacture and equipment repair. These welding services range from, weld overlays for part enhancement, weld buildup for part refurbishment, casting repairs and part manufacturing. The effectiveness of our specialized thermal spray process delivers unparalleled results in component restorations, corrosion protection, custom manufactured coating and wear resistance. PTA weld overlay is a versatile method of depositing high-quality metallurgically fused deposits on relatively low-cost surfaces. The robotics used in the PTA weld overlay process result in the application time being reduced and overlay material quantities being reduced. The precision control also keeps finishing costs significantly lower. Fusion Solutions, a new division of WCWT Holdings Inc. is adding a robotic Plasma Transfer Arc Weld Overlay machine to increase their capabilities. Used for applications of extreme service conditions requiring wear or corrosion resistance. Rebuilding worn areas, salvaging mismachined parts, or improving finished parts. Services range from weld overlays for part enhancement, weld buildups for part refurbishments, casting repairs and part manufacturing.